When I saw this the other day in a third grade classroom, I just had to snap a photo. 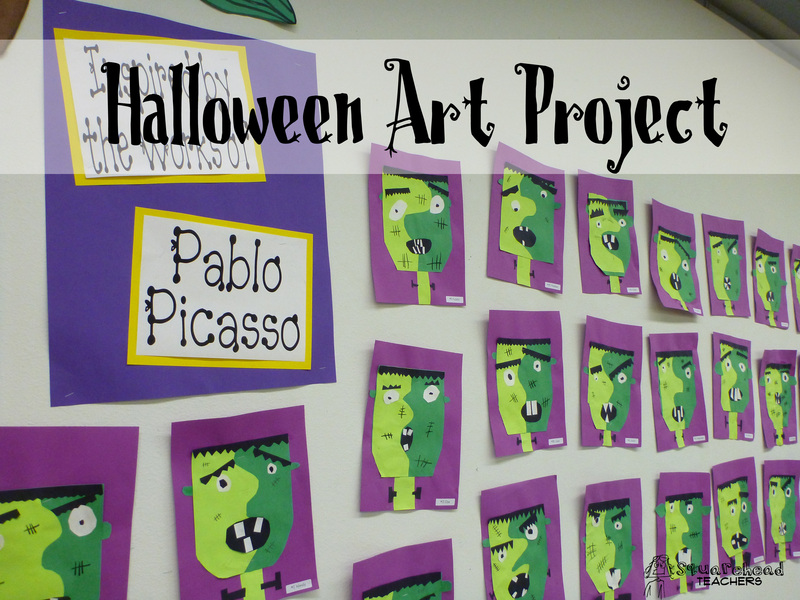 What a cute idea to make a Frankenstein in the style of Pablo Picasso! After looking at examples of Picasso’s work, students used construction paper, scissors and glue to create their own version of Frankenstein. Awesome! This entry was posted in Art/Crafts, Holidays/Seasons and tagged Children, Education, Elementary School, Kids, Teacher Resources, Teachers, Teaching by Squarehead Teachers. Bookmark the permalink. Do you have directions for this? Sorry, I don’t I saw this up in a classroom, and was only able to snap a quick photo. But I’d take a sheet of green paper and cut a head shape. Then I’d trace the outline of one side of the head shape onto a second piece of green paper (lighter shade). Then cut a wiggly/jagged edge down the 2nd side of the lighter one. Then glue the lighter (smaller) piece on top of the whole head shape and start decorating. Sorry, If I ever get to visit that classroom again, I’ll ask the teacher. Thanks for stopping by!